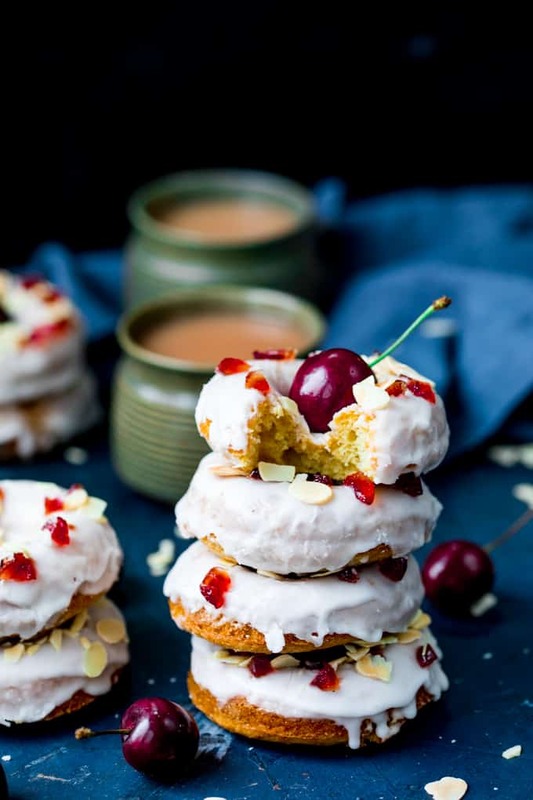 Cherry and Almond flavours come together perfectly in these baked cherry Bakewell doughnuts! This is one of Chris’s favourite flavour combinations of all time! Vanilla extract is all well and good to add extra flavour to cakes and bakes, but almond extract? Oh I love that stuff. I think I’d wear it as perfume if I wasn’t worried about the catnip effect it might have on Chris ???? 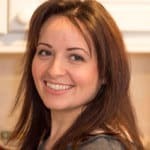 Although I do more savoury recipes on Kitchen Sanctuary, I do enjoy a bit of baking. However…. I can never resist a Bakewell tart when I see one in the shop. All cake-making thoughts generally go out the window, because I want it now. However, after the revelation of almond icing from my plum crumble bread, I realised it would be perfect for a baked doughnut glaze! Finished off with some chopped glace cherries and almond flakes? 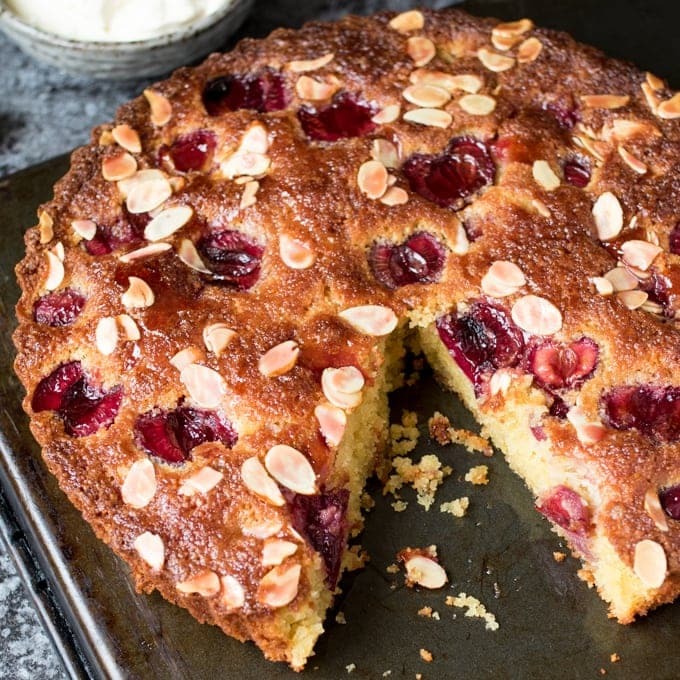 Yep, we had that homemade cherry Bakewell taste, and they didn’t last long! 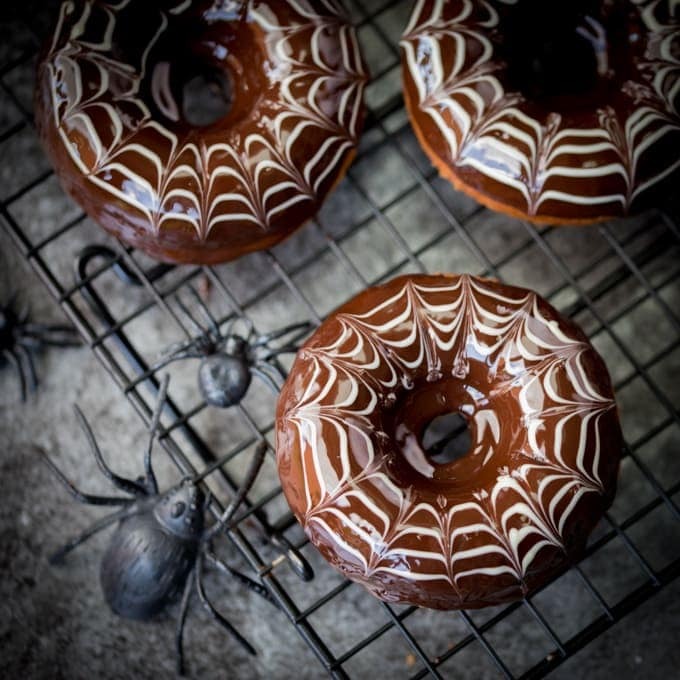 The doughnuts are beautifully tender, due to the addition of Greek yoghurt in the mixture. 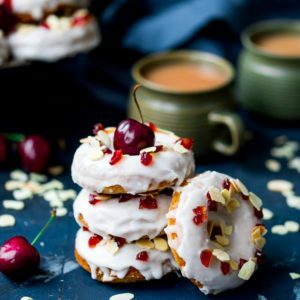 I first started using Greek yoghurt in some healthier grapefruit doughnuts a couple of years ago. 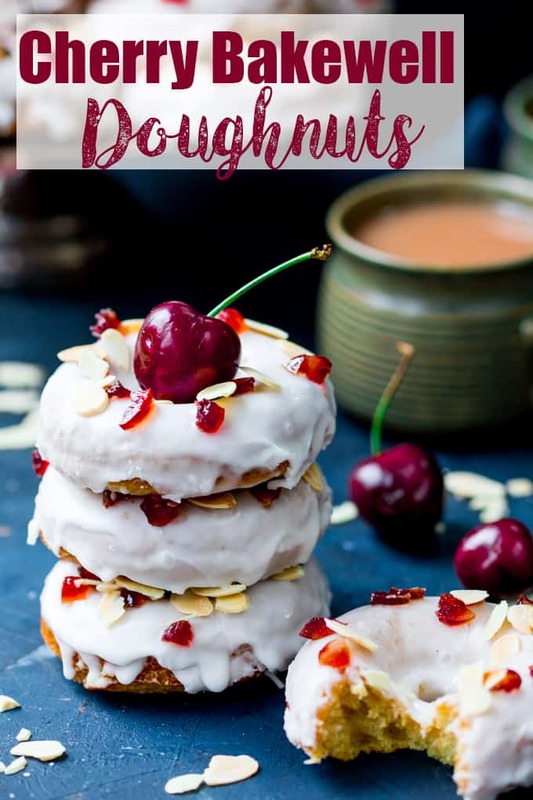 Fruit, wholewheat flour, coconut oil…..you know, not what you’d call healthy, but definitely better for you than the fried krispy kreme version. Anyway, I’ve continued to use it since in my baked doughnuts – although the more recent ones are certainly not on the healthier side! All things in moderation and all that ???? Looking back on previous posts, I’ve noticed I do have a tendency to go for the cherry/berry and almond combo. 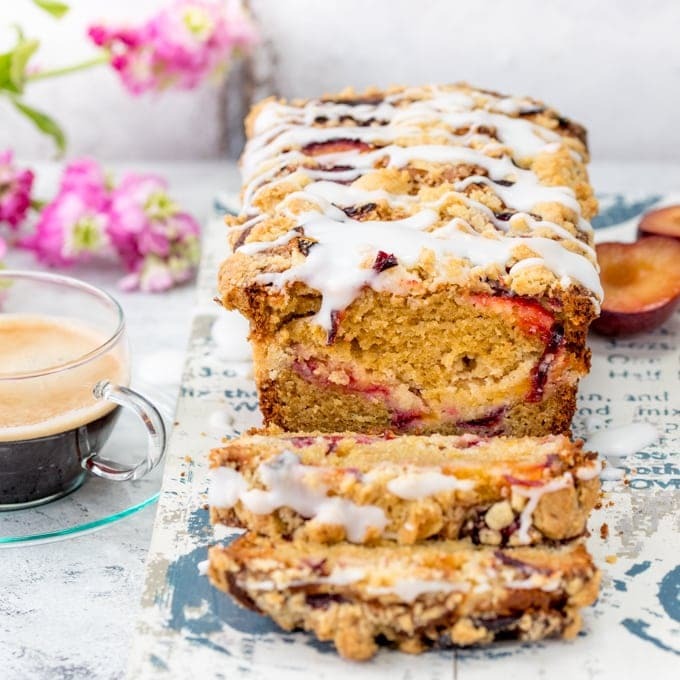 I’ve done blondies, granola bars and even toasties! I’m thinking cinnamon rolls or maybe a sweet bread version next! 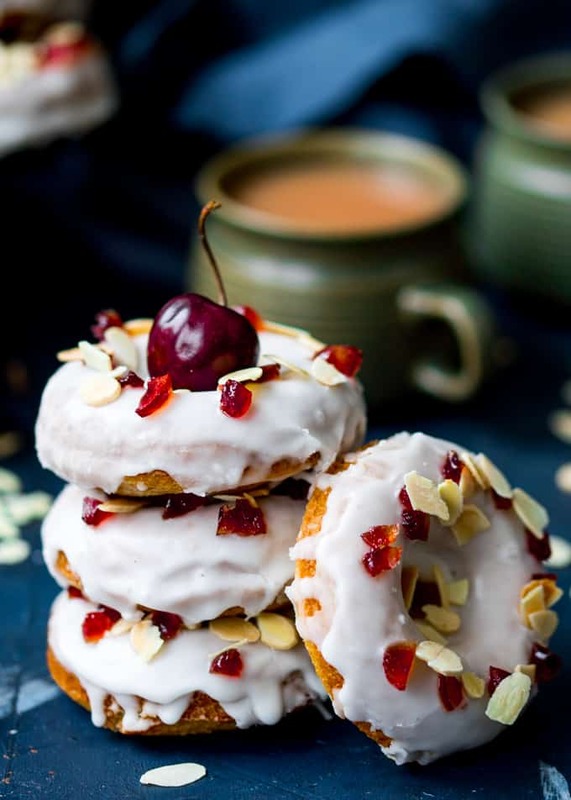 Cherry and Almond flavours come together perfectly in these baked cherry Bakewell doughnuts! Preheat the oven to 180C/350F. Grease two x 6-ring doughnut tins. In a large bowl, mix together the flour, sugar, baking powder, bicarbonate of soda and salt. Add in the egg, Greek yoghurt, vegetable oil, milk, vanilla extract and almond extract. Stir together with a wooden spoon until just combined. Spoon the mixture into a piping bag with no nozzle (or a plastic sandwich bag with the tip cut off to give a ¾” hole). Pipe the mixture into the doughnut rings. Sprinkle on the chopped glace cherries. Place in the oven and cook for 12-14 minutes until the doughnuts are golden and risen. Remove from the oven. Leave the doughnuts to cool in the trays. Place the icing sugar in a large bowl along with the almond extract and half of the milk. Stir with a whisk. Keep adding milk a little at a time, stirring after each addition, until you get a thick icing that coats the back of the spoon. Remove the doughnuts from the trays. Dip the smooth side into the icing and allow any excess to drip off. Place on a plate and sprinkle on chopped cherries and almond flakes before serving. Nutritional Information is per doughnut. 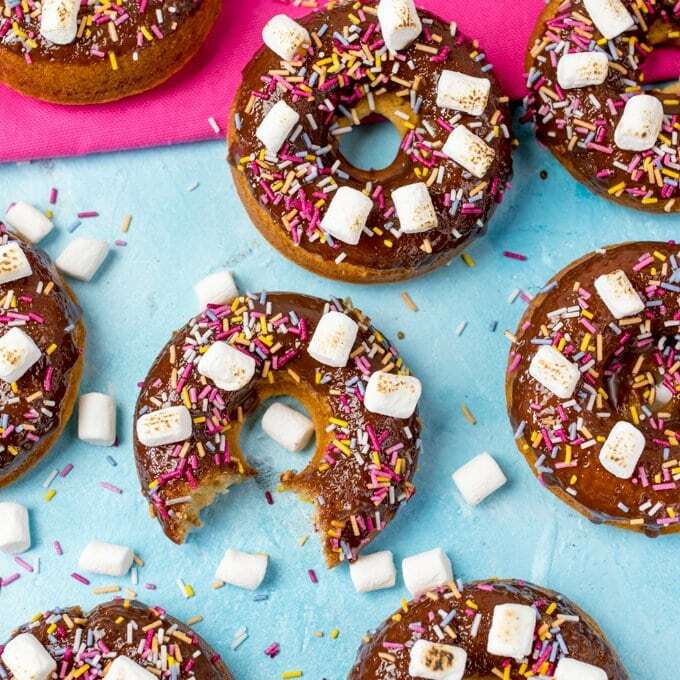 I too love the flavours of these doughnuts, they taste pretty good too.